The tiny, transparent zebrafish embryos swimming in tanks in a laboratory of the Natural Sciences Building may seem like an unlikely choice to unlock the potential of stem cells, but David Traver intends to do just that. Traver, an assistant professor of biology at UCSD, uses the zebrafish as a “model organism” to study the development of the blood and immune systems in humans. The inch-long, striped fish has many characteristics which make it ideal for studying the development of an organism from a single-celled embryo into a multi-cellular adult. For starters, eggs are fertilized as they are laid, meaning the entire process of development takes place outside of the animal. As an added bonus, zebrafish embryos are transparent, allowing researchers to directly view every stage of development as it naturally occurs. This type of study is impossible in mammals, such as mice, where fertilization and early development happens inside the womb. Additionally, a host of genetic tools are available which allow researchers to mark individual cells, measure the expression of genes and tinker with cellular processes. With these tools, Traver and others working in his laboratory aim to thoroughly characterize the progression of the first cells of the embryo, which scientists call “pluripotent,” meaning they have the potential to turn into all adult cell types, to adult stem cells and finally to specialized cells. Adult stem cells are called “multipotent,” because they have the potential to turn into the different cell types of a particular tissue, as opposed to specialized cells, such as skin, blood or heart cells, which are locked into one specific cell type. Close up confocal image of two zebrafish embryos expressing dsRED under control of the LMO2 promoter. Vessel structure can be easily studied using this animal. In terms of the blood and immune systems, the main focus of Traver’s research, this progression occurs from early embryonic cells (which can turn into any type of cell found in the body), to hematopoetic stem cells (which can only turn into blood or immune system cells), to individual blood cells or immune cells, which are specialized to perform a unique job. 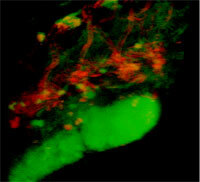 “A major focus of the lab,” according to Traver, “is to do simple imaging experiments by marking stem cells and observing what they do and where they go, in order to figure out how these cells behave in their natural microenvironments.” Once the basic behaviors of stem cells are understood, genetic tools can be used to dissect the genes that are important for more specific processes, such as committing to a specialized fate. His long-term goal of gaining a detailed understanding of blood and immune system development in zebrafish is that it will eventually be used to help design stem cell treatments for people with blood or immune disorders. Two day old transgenic zebrafish embryo expressing GFP under control of the ubiquitous b-Actin promoter. Attempting stem cell therapy without this understanding could lead to a failure of therapy, or worse, an uncontrolled growth of cells commonly known as cancer, he adds. The insights Traver learns about the progression of stem cells into the cells that make up the blood and immune system may shed light on the progression of stem cells into all other types of cells, such as brain or muscle cells. Furthermore, other scientists who study the immune system of mammals can apply the lessons learned from the zebrafish to develop better treatments for humans. Although zebrafish and humans are very different physically, many of the underlying biological processes are quite similar. Additionally, Traver’s work will address the possibility of using adult stem cells instead of embryonic stem cells for regenerative medicine. Since adult stem cells can be acquired without destroying an embryo, many of the ethical dilemmas associated with embryonic stem cells are avoided, he notes. Traver’s work on characterizing the progression of pluripotent stem cells into adult hematopoetic stem cells will provide this much needed information about the differences between adult and embryonic stem cells.